Why Bede’s Wall? Why name this weekly column after an Anglo-Saxon author from the eighth century, whom some might consider an obscure figure? Bede (c.673–735) was an English Benedictine monk and scholar and is chiefly known for his Historia ecclesiastica gentis Anglorum (Church History of the English People), a history of England from the Roman occupation to 731, the year that Bede completed it. He lived through momentous times: it was a day when the Byzantine empire and the Western Germanic kingdoms were threatened by the vast pincer movement of the Muslim advance. Two decisive battles saved Europe from Muslim conquest: in 718, the Muslims were defeated before the walls of Constantinople; and in 732, the Muslim army was defeated at Tours in France. Despite such world-shaking events that were going on in his lifetime, his own life was relatively uneventful. He was born near Wearmouth, in northern Northumbria (now Sunderland, England). His parents would have been Christians, but his grandparents were probably pagans. When he reached the age of seven, he was turned over to Benedict Biscop, abbot of the monastery of Wearmouth, to be raised as a monk—a common practice in the early Middle Ages. From the time when he was taken to the monastery as a young boy, Bede tells us: “I have spent all my life in this monastery, applying myself entirely to the study of the Scriptures; … I ever found it sweet to learn, or to teach, or to write” (Historia ecclesiastica 5.24). He probably never went further south than York and no further north than Lindisfarne. Bede never became an abbot, let alone bishop. He never met any rulers of state. “Even his holiness,” in the words of the medievalist David Knowles, was “unobtrusive. He wrote of the wonders worked by others, but none are recorded of him. He described the conversion of England, but he probably never preached to anyone outside his monastery.” Nevertheless, his Bible commentaries reveal him to have been one of the most learned men of his day. He was fluent in Latin as well as his native Anglo-Saxon. And he also appears to have known Greek fairly well. 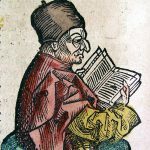 Most importantly for this column, Bede sought to be a faithful historian, recording the way that God had brought about the conversion of his Anglo-Saxon people. In the same way, the goal of this column is to serve the God of history whom Bede sought to serve with alacrity and integrity.